A hydrosulfuric mist enveloped Moscow. For several days the pungent smell of sulfur hung in the air, whereupon the level of hydrogen sulfide was found to be six times higher than normal. The authorities blamed an oil refining plant in the South of Moscow, whose management denied reports of an accident. In Siberia, meanwhile, snow and cold weather arrived. Although locals greeted the early winter, they are already dreaming of the warm summer sun. 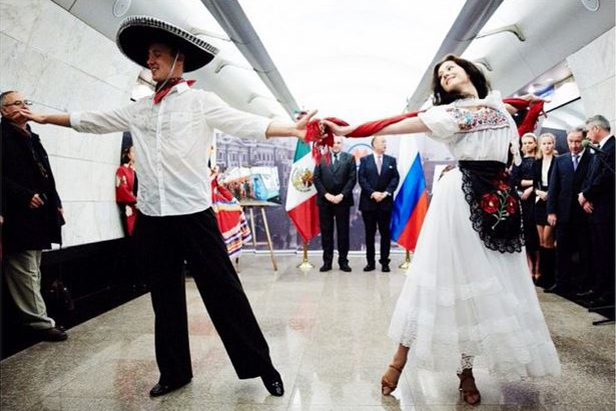 On November 12 Mezhdunarodnaya subway station marked the official launch of the “Poetry in the Metro” train with a new exposition created by the Embassy of Mexico and dedicated to the works of Mexican poet and Nobel laureate Octavio Paz. Russia’s finest instagram-users were assembled once more, only this time at the Hermitage as part of the #EmptyHermitage event. The Bolshoi Theater hosted something similar a couple of weeks back. The #Empty movement seems to have captured Russia’s imagination, so no doubt we can expect to see some snaps of, say, a vacant Moscow Planetarium or Polytechnic Museum. The Russian men’s national short-track team (Ruslan Zakharov, Semyon Yelistratov, Dmitry Migunov, Vladimir Grigoriev, Viktor Ahn) won the U.S. leg of the World Cup in the 5000m relay.